The brilliant actor Christopher Lee died Sunday at the age of 93. He will always be remembered to James Bond fans for playing the villain Francisco Scaramanga in The Man with the Golden Gun. Apart from Roger Moore’s stylish Cyril Castle suits and Frank Foster shirts, Christopher Lee is the best reason to watch The Man with the Golden Gun. His performance alone made the assassin Scaramanga one of the most memorable Bond villains. For the final duel on Scaramanga’s Island, Lee wears a light blue tropical outfit that takes from both tradition and fashion. Though he looks very much a product of the 1970s dressed head-to-feet in light blue, the colour perfectly suits the tropical marine climate of Scaramanga’s Island. Scaramanga’s pale blue lightweight cotton poplin shirt has a unique and practical design. It’s inspired by the bush shirt, but in pale blue it has a looks more tropical than it looks safari. 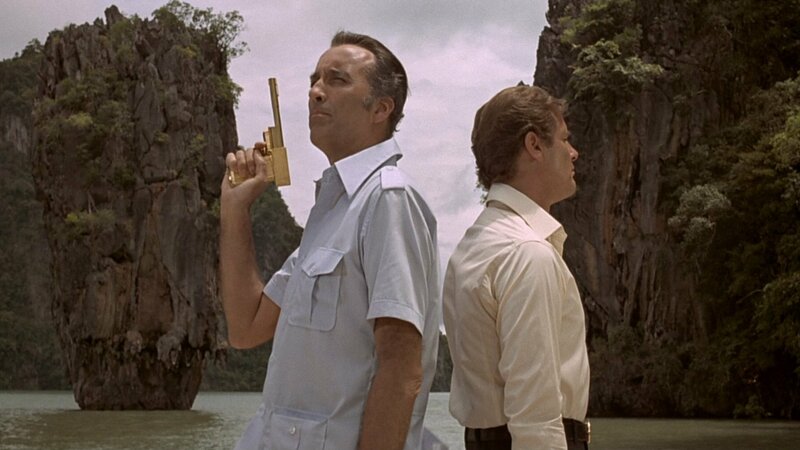 The shirt was made by Thai tailor Harry, on location where The Man with the Golden Gun was partially made. The short-sleeve shirt is mid-hip-length and has many jacket-like details, though it’s not designed to be worn as a jacket. The shape is more jacket-like than shirt-like, as it’s tapered at the waist and flared at the hips. Scaramanga wears this casual shirt untucked, and like a proper untucked shirt it has a straight hem. The collar is a tall and long two-piece point collar. There are five buttons down the shirt’s plain front, The front of the shirt has three patch pockets—one on the left side of the chest and two at the hips. The pockets are rounded at the bottom corners, have a box pleat in the middle and have pointed, buttoned-down flaps. The top pocket has a separate pen pocket accessed from above the flap, which Scaramanga uses for a gold pen that makes up part of his golden gun. He wears the bottom left pocket flap tucked in to the pocket. The back of the shirt has a one-piece yoke, a sewn-on half belt, an inverted box pleat between the yoke and belt, and a centre vent below the belt. The shirt also has pointed shoulder straps. Multiple shirts were made for these scenes, but there are a few differences between them. 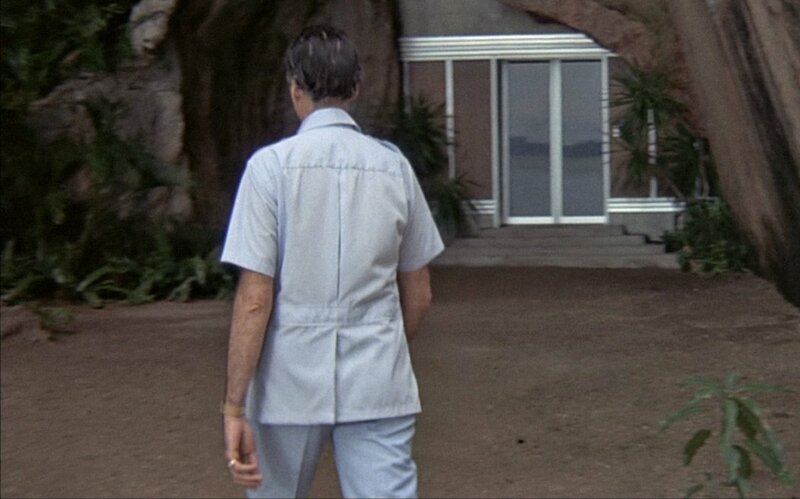 The shirt Scaramanga wears when walking with Bond to the door of his dwelling has shirring at the yoke and belt, whilst the other shirts have flat seams on the back. 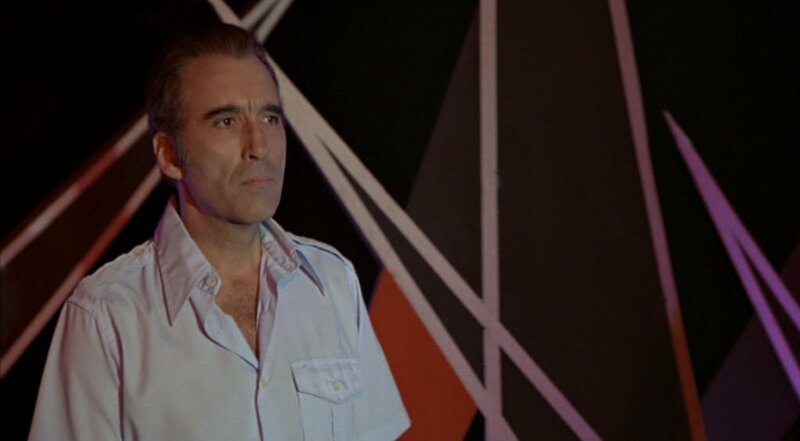 Some of the shirts have clear plastic buttons whilst a shirt that Scaramanga wears when first seen in the funhouse has off-white plastic buttons. Both sets of buttons are around 24 linge, which is the button size typically found on suit jacket sleeves. This shirt also does not have a hole in the top of the breast pocket for a pen (which at this point in the film had been made into the golden gun). This shirt has similarities to casual shirts Bond creator Ian Fleming—who was also Christopher Lee’s cousin—would wear in Jamaica. Fleming has been photographed wearing similar white and navy shirts, but Fleming’s shirts had full belts rather than a half belt in back, and they did not have shoulder straps. The shoulder straps on Lee’s shirt are clearly inspired by the safari jacket’s popularity at the time. 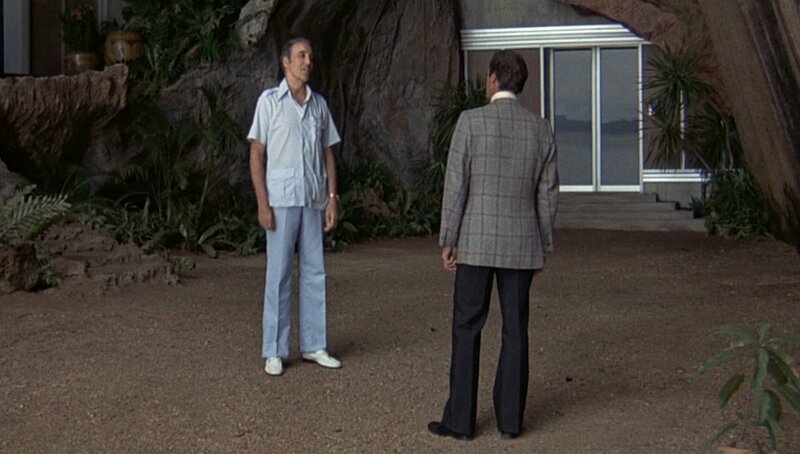 Scaramanga’s trousers are sky blue and slightly darker than the pale blue shirt. The trousers are made of a heavier cotton—most likely in a twill weave—than the shirt since trousers need to be sturdier than shirts do. The trousers have a flat front and flared legs, with a more pronounced flare than James Bond’s Cyril Castle trousers have. Though the shirt and trousers don’t contrast much in colour, the contrast in weight and texture help. The shoes are white horsebit slip-ons with a black sole and heel. 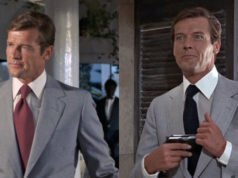 Like James Bond’s horsebit slip-ons in The Man with the Golden Gun, Scaramanga’s are also likely from Gucci, but they contrast Bond’s black and brown shoes. Gucci was prominently featured in this film; Bond wears Gucci shoes and belts, and his suitcase is from Gucci. Goodnight’s handbag is also from Gucci. One example of Scaramanga’s shirt—the one with off-white buttons—was auctioned at Prop Store on 16 October 2014 for £5,000. I always surprises by fact that the english language not have diversified words for nominate different shades of blue. For exemple,in Italian “sky blue” is “azzurro”,sea-green blue is “turchese”,baby blue” is “celeste”,blue midnight” is “turchino scuro”. Said this, RIP to Sir Chistopher Lee,a great actor (that maybe deserved a even more better career) and a fine Gentleman. Christopher Lee is my absolute hero. He has been my main inspiration as both an actor in screen and a gentleman off screen. While it may not have been the first movie I ever saw him in (since he’s been in so many) The Man With the Golden Gun was the first film I took note of who he was. After that I started seeing him everywhere I’ve loved him ever since. I was terribly sad hearing that he’d died, but he seemed like the type of person who would have come to terms with the idea years ago. And that’s a small comfort. To actually discuss the topic, though, I do like this shirt. Lee wears the style well and looks incredibly comfortable. I like the colour, and though the blue shirt, blue trousers and white shoes isn’t a look I would attempt I wouldn’t change it here if given the chance. I feel as though it suits the slightly ostentatious, yet still gentlemanly, demeanour Scaramanga commands. Showy, yet not obnoxiously so. It looks like he wore Moore’s blazer with the yellow turtleneck in The Wicker Man. RIP Mr Lee. I wonder wear he keeps the gun’s trigger cuff link in a short sleeved shirt…? In all honesty I think he IS the best thing in the film although Tom Mankowicz’s choice of Jack Palance would have made more sense for an arrogant gun obsessed cowboy character as written by Fleming. Lee instead gives us the Anti-Bond, with similar taste in style, food and women. I too adore this man and have been collecting his TV and film appearances for nearly 24 years. I almost gave up as he was making them faster than I could buy them. If only we could all live to release heavy metal albums in our 90s. To you, Mr Lee. You are the best. Best being a useful four letter word. Always liked Mr. Lee and as stated above, his talents probably deserved a better career but I think despite being prolific, he found it difficult to shake off the cheesy Hammer association. The movie is indeed one of the weakest, and it hasn’t aged very well, but I have to disagree with Rod about the clothes; making some concessions to the time period, they are some of the best of the entire series. Moore looks consistently terrific, and the combination of exotic settings and 70’s glamour somehow works in the movie’s favor. Let’s not be guilty of chronological snobbery! Although Lee made it work by his acting talent, and although the shirt has some qualities (a colour scheme perfectly appropriate for the climate, and a rather interesting and original look), I think it looks really bad simply because the shirt doesn’t flatter at all Lee’s body shape. The very long shirt, the pointed collar, two pockets at the hips… it looks like Lee have big hips and a skinny chest, while Moore looks much better in his outfit, even if the jacket is perhaps out of place here, considering the climate ! I, too, always thought the outfit made Lee look a bit pear-shaped, even though his height and his voice still made him an imposing presence. Except for Jaws, he is the only other villain to make Moore look puny. Surely you don’t mean to say that the DB blazer in TMWTGG is “beyond the pale”? I think it is one of the best of the series. The plaid sport coat is also gorgeous, albeit a little out of place. I even like the ivory safari jacket, even though I realize that is a minority opinion. His cream dinner jacket is quite nice too -although I never liked narrow overlaps on a double-breasted jacket. I am certainly not a fan of Moore’s acting as Bond but I certainly agree with you David. This movie has much more great outfits -the marine blue suit and the light grey silk suit coming at the first place- than terrible ones -apart from the two safari outfits, everything else looks fine ! Actually, I think Lee’s performance and the clothing are the two only reasons to watch the movie, because in terms of script, even Licence to Kill had a better story… but the wardrobe is another matter ! 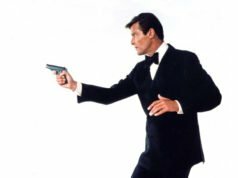 In term of pure sartorial interest, as far as I am concerned, the most terrible Bond movies are Moonraker, Licence to Kill and Skyfall. Dan, it was probably just badly worded on my part. Certainly these clothes aren’t “beyond the pale” for me, rather for the critics of Moore’s fine tailoring in this movie. I would have thought that anyone sartorially discerning would have appreciated his suiting in TMWTGG even if they didn’t appreciate the other outfits. An “oddball/dinosaur” like me can appreciate even your minority stance on the safari sports coat! I always likened this one to a guayabera, to substantiate Scaramanga’s Cuban heritage. It’s not exact, but the style is there. I don’t know why Roger Moore’s checked, woolen sport jacket makes sense in terms of the plot. What I do believe is that it would be hellish to wear in Thailand, really, anytime. Moore looks like he’s about to go hunting at a country manor outside of London on a brisk, fall day. I can’t even imagine a more striking mismatch between clothing and setting. Moore’s jacket makes sense in the plot because it allows him to only change the jacket when dressing in the dummy’s clothes in the funhouse. The jacket is not woolen, it’s an open-weave likely in high-twist worsted wool or silk and worsted wool blend. One would be fairly cold wearing this on a brisk, fall day. Have you seen my article on The Checked Sports Coat on Scaramanga’s Island? I think the final showdown between Bond and Scaramanga on that island really makes TMWTGG worth seeing. That location is breathtaking and the idea that he lives in a house inside that rock really captured my imagination. 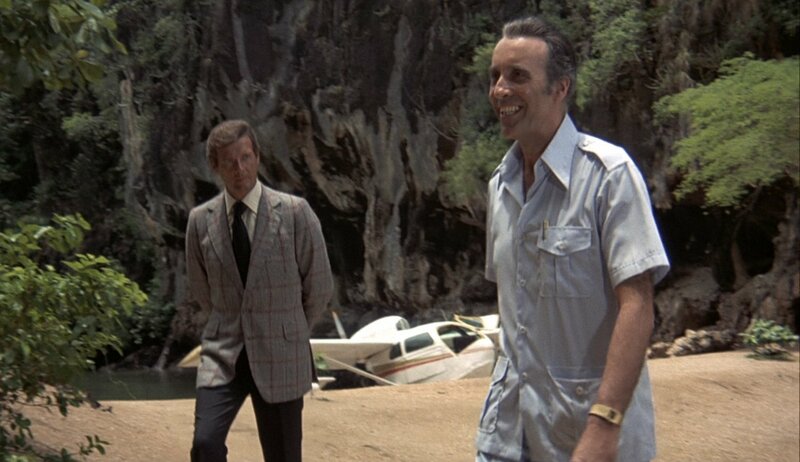 I guess Scaramanga’s outfit is more appropriate for the heat than Bond’s jacket. But Bond doesn’t necessarily wear appropriate clothes for the location or his job as a spy. 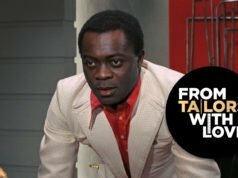 Here is an interview where Moore jokes about why Bond wears such inappropriate clothes for the heat. And how he could literally go one take and he would have to change his shirt. Very sad to hear of Christopher Lee’s passing. I think he is a terrific actor whose performance never fails to scare me. I’m not too fond of the shirt details but I really like the color. I would love a casual shirt in this color. I think cream or khaki trousers would look much better than the sky blue he wears here, though. I too was saddened by the news of Lee’s passing. War veteran, a range of memorable acting roles, and an genre icon to three generations, from Dracula to Bond to Sarumon and Dooku, he certainly will be remembered by millions who never had the chance to meet him. As for this post, he fits in well with the 70’s look, and his Scaramanga is one of the highlights of the series, unfortunately wasted in this truly terrible movie. I have to agree with David and Le Chiffre. I find this movie to be one of the few in the series that has almost no redeeming value, but the clothes are generally nice and they work in a tough color palette chosen by the two directors of photography (and Guy Hamilton, who seems to favor browns and I continue to think did a lot of damage to the series). As much as I love Dalton’s Bond and think sSkyfall may be top 5 Bond, L2K and Skyfall are, sartorially, probably at the bottom of the series. Christopher Lee was a fascinating individual and certainly one of the most memorable Bond villains of all time (Come come Mr. Bond, you derive just as much pleasure from killing as I do!) I agree with the general consensus that the film is one of the weaker entries in the series (which has been described as “the one where Bond behaves like a jerk to everybody he meets”), but I have to agree with Dan about the clothes, they’re among Moore’s best. As a bit of an aside, I’ve also noticed that Maud Adams is conspicuously absent from our list of the film’s redeeming qualities! Agree,”The man with the golden gun” is at the best a mediocre Bond movie. The clothes conversely are remarkables; Moore was never so well dressed in the series. Scaramanga/Lee is a good villain,but wasted in that plot. I read your 2011 post about this outfit, Matt. I understand now that Bond’s jacket here is not so autumnal as it looks (or at least as it looks to me). And the plotting can make anything reasonable — if the plotting is any good… I for one hope the plot makes a little sense because whatever the weight/material of this jacket, the whole outfit looks simply ridiculous in its setting. Perhaps Bond wanted to be sure to be properly dressed for any occasion, since he hardly knew what he would find when landing on the island. Perhaps a sports coat along the lines of the beige hopsack jacket in Live and Let Die would have looked more appropriate in this setting than this jacket, but Bond’s jacket goes very well with the charcoal trousers that were necessary to wear for this scene. A blue check rather than a red check may have made this match the tropical climate better, but I’m sure the open-weave cloth is somewhat comfortable in this weather. Hello there, Matt. Perhaps it may yet be a good idea to do an analysis on Nick Nak’s morning suit worn during the duel between Bond and Scaramanga. And throughout the film Nick Nak shows he is no slouch in the tailoring department. He is well-tailored! But he’s not wearing morning dress, he’s in a butler’s uniform with a dress coat (like for white tie) with cashmere striped trousers. Lee was indeed a very fine actor and also somebody who certainly knew how to dress well. He always was a very stylish appearance. I have enjoyed all of Christopher Lee and Peter Cushing’s films and i love Christopher’s singing he sings with such a dark mellow voice especially when it comes to opera, he is a clever man with such diversity and charm. i will miss Christopher and Peter so much. i do not think i will ever get over there deaths. R I P Christopher and Peter see you in heaven, i will be looking out for you both.